Global fresh water demand is enormous and accelerating exponentially. This reality sets our mission: To supply high quality potable water to specific markets by the most efficient and ecologically responsible means. In accomplishing this we first look at markets and their needs - out 50 years. Everything we do is market driven, not technology or supply driven. This is a key difference between what we do and our competitors. Yes, we have proprietary technologies and processes, but we only apply them as a choice for markets when it is apparent they fit. But there are thousands of other technologies, low and high tech that may be more appropriate - we suggest what the market needs, within their economic, social/cultural, and ecological acceptability - still looking out 50 years unless asked to look further. When you open "Our Technologies" you will discover a number of innovative, game changing technologies and approaches that are either proven, in development and patent processes, or emerging concepts. We push the envelope because - that's who and why we are. Get to know "Our Team", they are an impressive group of globally aware and experienced professionals we have come to know and respect over this journey. Together this team is quite remarkable in its breath of knowledge, global experience, and skill sets. We are always looking for exceptional people committed to the same purpose as we are. Interested? Send us an email with a resume and references. If you have something exceptional to offer, you never know when or where we may call upon you. We provide unique consulting services for companies, countries, specific markets, and individuals around the world. In almost every corner of the globe that faces serious water challenges, we have worked for clients. So look into our "Services" and if you have the need for help in solving a water problem, send us an email. It never costs anything to ask a question and you might be surprised at our answer. 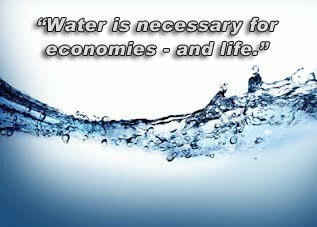 In "Water Supply" you will learn that as a result of our work we have direct relationships with extraordinary water sources in various areas of the world that just might be of interest to your markets. As a special feature we include "New Water". This is a review and update on revolutionary technologies in development as well as new publications on the restructuring of water and its applications. The work to date has been very promising and has already created new product lines, now in the market. It's really about the science of water, how its structured, and how that molecular structure can be naturally manipulated to make our drinking water even more valuable by increasing its pH and other affects. If you decide to "Contact Us" we suggest email first. If one member of the team doesn't have an answer, we immediately share the question and see what we can find out. Have "they" told you your idea doesn't work? We delight in proving "them" wrong. Email is the best first contact as we all live in different time zones and often travel. Hope to hear from you soon.